Josefina López is best known for authoring the play and co-authoring the film Real Women Have Curves, a coming-of-age story about Ana, a first-generation Chicana torn between pursuing her college ambitions, a personal goal, and securing employment which is a family expectation. Along the way, Ana confronts a host of cultural assumptions about beauty, marriage and a woman’s role in society. 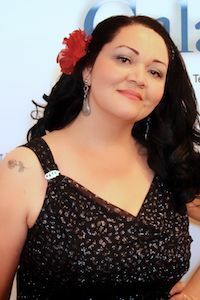 Although Real Women Have Curves is Lopez’ most recognized work, it is only one of many literary and artistic works she has created since her artistic career began at 17. Born in San Luis Potosi, Mexico in 1969, Josefina Lopez was five years old when she and her family immigrated to the United States and settled in the East Los Angeles neighborhood of Boyle Heights. Josefina was undocumented for thirteen years before she received Amnesty in 1987 and eventually became a U.S. Citizen in 1995. Josefina has been an activist and has been doing public speaking for over 20 years and has lectured on various topics including Chicano Theater, Women’s History Issues, Minority representation in Cinema at over 200 universities such as Yale, Darmouth, and USC. She also has a magazine column called “Ask A Wise Latina”. She has been the subject of countless TV & Radio interviews in which she has passionately discussed immigration issues and other controversial subjects concerning women and minorities. Josefina is the recipient of a number of other awards and accolades, including a formal recognition from U.S. Senator Barbara Boxer’s 7th Annual “Women Making History” banquet in 1998; and a screenwriting fellowship from the California Arts Council in 2001. She and Real Women Have Curves co-author George LaVoo won the Humanitas Prize for Screenwriting in 2002, The Gabriel Garcia Marquez Award from L.A. Mayor in 2003, and the Artist-in-Residency grant from the NEA/TCG for 2007. Even though she is best known for the success of Real Women Have Curves, Josefina has had more than 80 productions of her plays throughout the United States. In addition, Josefina also paints, writes poetry, performs, designs, and is a mother of two boys and resides in Silver Lake. She is the Founder and Artistic Director of CASA 0101 Theater in Boyle Heights. At CASA 0101 her commitment is to teach screenwriting and playwriting and nurture a new generation of Latino artists. Josefina is actively working to create an Artist District in Boyle Heights where theater, arts, music can flourish and create opportunities for the many talented artists who reside in Boyle Heights or grew up in Boyle Heights and want to return to contribute. Josefina is presently developing the musical version of Real Women Have Curves for Broadway. Her first novel titledHungry Woman in Paris came out in 2009. She wrote a play to protest SB1070 titled Detained in the Desert, which won her many awards and she is turning it into a feature film. She is currently working on numerous other writing projects. For more information please go to Josefinalopez.co & Hungrywomaninparis.com & casa0101.org. 323-263-7684. To learn more, please visit www.reelrasquache.org. Enrique Morones. Admission is $5 per person. Tickets can be purchased at www.eventbrite.com/e/detained-in-the-desert-tickets-10609052963. To learn more, please call 215-569-4666 and visit the website www.pontealdia.com. Ernesto Martinez); Josh Luteran (as Matt (Dylan) Thomas); Natalie Camunas (as J.C.); Javier Lezama (as Saul/Raul) and Alejandro Ruiz (as Chuy). Real Women Have Curves Studio is an independent production company founded by Josefina López whose mission is to make films that celebrate women of all shapes and sizes and reveal the authentic stories of Latinos in the U.S. Detained in the Desert is the new studio’s debut film. Detained in the Desert parallels two completely different people: Sandi Sanchez, a second-generation dark skinned Latina, and Lou Becker, an inflammatory talk show radio host, whose lives converge in the Sonoran desert in Arizona. An Arizona cop racially profiles Sandi, who refuses to show her identification in protest. Her act of rebellion sets her on an unexpected course toward immigrant detention. Conversely, three siblings who have just suffered the loss of their brother due to a hate crime influenced by Lou’s racist radio talk show, kidnap him in hopes of seeking justice. While Sandi is being transferred to another immigrant detention center, her I.C.E. bus crashes in the desert. She escapes only to end up stranded in the desert. Lou is freed by one of his supposedly remorseful kidnappers. Consequently, Sandi and Lou meet in the desert and help each other survive. Both Sandi and Lou come to understand the severity of the plight of the immigrants through a gruesome discovery. Josefina López. The play is López’s response to the anti-immigrant atmosphere in Arizona and the rise in violence against Latinos fueled by extremist media. The independent film is produced by Real Women Have Curves Studio and fiscally sponsored by Josefina López’s non-profit organization, CASA 0101 Theater. The project is a human rights film and fundraiser for Border Angels (www.borderangels.org), founded by Enrique Morones in 1986. Border Angels is a non-profit organization that works to stop the unnecessary deaths of individuals in the desert by delivering water in key points where migrants cross the desert. This film is a stand against hate, and hate crimes in the U.S. against immigrants and their families. López has won several awards for the play, Detained in the Desert (2010), and she now wants to take it to a bigger audience so people can learn about the true plight of Latino immigrants and shatter myths and misconceptions concerning illegal immigration. Being an immigrant herself, López wants to give a voice to the undocumented people who are scapegoated and vilified, yet are the most powerless to tell their side of the story. López was also inspired to write this story after having participated in Marcha Migrante led by Border Angels’ founder Enrique Morones by visiting a cemetery in Holtville, Arizona where the unclaimed bodies found in the desert of over 600 migrants are buried. She got to see photos of the bodies found in the desert and was haunted by the images she saw. López has also seen Enrique Morones tirelessly put out water at the water stations in the desert to help migrants crossing the Arizona desert stay alive. He has also debated Arizona Sheriff Arpaio and other anti-immigrant activists, as he continues to fight to shatter myths about immigrations with his humanitarian work. López wanted to create a movie that could help raise funds for Border Angels so they can continue to do their humanitarian work at the desert on a larger scale. When Josefina López watched the award-winning short film, Child of the Desert (2011), by director Iliana Sosa, she felt that Sosa could adapt her play, Detained in the Desert, into a film. For Sosa, this film boldly and unapologetically addresses issues of Latino/a identity, the unnecessary deaths of immigrants in the desert and the deadly impact that hate speech in the media has on communities of color.